In her first letter to John White, Managing Partner of Beauchamps Solicitors, Saoirse Maxwell appealed for information about Dolores' estate, and also briefly brought to his attention a few of the very many things that trouble her and others concerning the administration of Dolores' estate. Dolores' estate has three executors – Ethan Maxwell, Joseph M Bowe and John Cunningham. 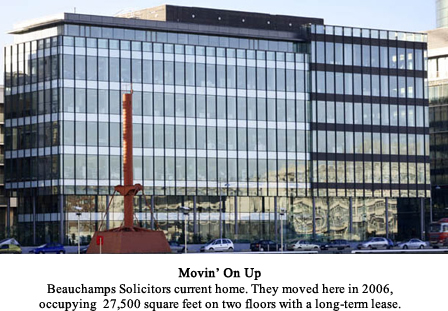 Mr Bowe and Mr Cunningham are solicitors in the Private Client section of Beauchamps' practice. From our view Mr Cunningham, although appointed as one of Dolores' executors, seems disengaged and apparently relies on Mr Bowe and Ethan to administer Dolores' estate. We can find no evidence of any phone calls or correspondence to the beneficiaries of Dolores' estate coming from him. Perhaps he is content to sign documents and merely collect his fee. Mr Bowe's response to both Saoirse and her brother's request for an update each contain a strident denial of any knowledge of the troubling things Saoirse mentioned in her letter to John White. When the members of this site saw Mr Bowe's denial,we were left speechless, and that is an uncommon occurrence. Simply, Mr Bowe's flat statement is untrue. For those who visit our site casually, we offer some (hopefully brief) background and explantion of why this is so. Readers who are familiar with Dolores' story are asked to bear with us, or skip down to where we address his statement directly. The earliest inkling we can find of what we perceive to be the special relationship between Mr Bowe and Ethan Maxwell occurred in 2005, when Mr Bowe acted for Ethan in a property matter. Unfortunately, Joseph Bowe at the same time in the same transaction represented the other party, Dolores and Cecil Maxwell. Dolores and Cecil had recently sold their house in Dublin, where they had lived for nearly fifty years, and realised a large gain from it. 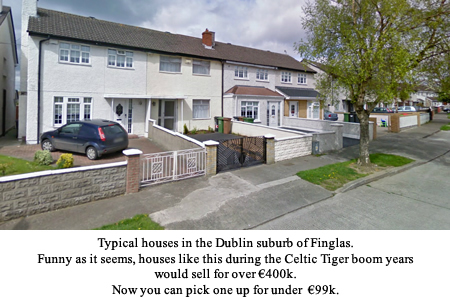 Using these proceeds, Ethan purchased a house in Finglas, on the northern side of Dublin. Mr Bowe, by his own admission, was warned by at least three different sources that Dolores and Cecil were acting under coercion and undue influence by his client Ethan. In an Affidavit sworn by Nathaniel Maxwell he details a conversation with Beauchamps Solicitors where he expresses the terror his parents were in. Cecil told Nathaniel that he had to go through with the transaction because he was in fear for his life. Mr Bowe was concerned enough about this information that he sought “outside counsel,” albeit from a former member of Beauchamps. He was not troubled enough to cease acting for one or both parties, or to insist that his clients Dolores and Cecil Maxwell seek independent legal advice. By whatever device, Mr Bowe concluded there was no conflict of interest. And so at the age of 31, Ethan Maxwell, unemployed and still dependent on them for support, finally moved out of his parents home and into his house in Finglas, 100% paid for, later selling it to his housemate and Ethan–appointed “family spokesman” Lloyd Montgomery. In 2005, a few months after Ethan received his house in Finglas and in circumstances eerily like the events of Dolores' last year, Cecil's brother Patrick fell ill. Ethan took up residence in Patrick's house, and proceeded in due course to attempt to make Patrick a Ward of the Court, with himself as the sole “Committee” controlling Patrick's affairs, property, and assets. I refer to your e-mail of 16th February. I also spoke yesterday with your father. As it may be some time before anyone can tell whether your uncle has the necessary capacity to complete an Enduring Power of Attorney, he instructed me to go ahead with the wardship application. I am inclined to agree that this does make sense. If by chance your uncle makes a good recovery, he could complete an Enduring Power of Attorney at that time and we would simply abandon the wardship proceedings. My assistant here, Redacted, is much more familiar with wardship proceedings than I and always has a few “on the go”. With this in mind, and on the assumption that you would have no objection, I have given her the file and papers and I have asked her to contact you setting out the information/documentation she needs to progress matters. Perhaps the first issue to settle is whether the application should be in your name or your father's. Because he is in Rosslare, it would be more practical to have you looking after matters but reading your e-mail of 16th February, it is clear that your uncle William also wants to be involved. If there is the possibility of rival applications, then it really would be better if we were dealing with your father (as opposed to yourself) since he would be seen as having a similar entitlement to your uncle. However, this is something I will leave to Redacted (Bowe's assistant) to sort out with you. It bewilders us as to why Mr Bowe felt compelled to consider whether or not Ethan would “have no objection” or that he would consider Ethan to have “similar entitlement” as Patrick's two brothers. In light of Mr Bowe being informed of the abuse his elderly clients Dolores and Cecil suffered from Ethan, we find it deeply disturbing to think that Mr Bowe would allow, let alone encourage and aid, his client Ethan Maxwell to have control over another of Beauchamps' elderly clients. [Editor's note: We have briefly touched on the events surrounding Ethan Maxwell and his uncle Patrick on this site, but look forward to doing so in great detail in the future. We note that Ethan indeed pushed very hard to hurry things up with this Ward of Court application, but was unsuccessful. Patrick died before Ethan's plan could be realised. Ethan then sought to shake down Patrick's estate for a little bit more than €40,000, but was stymied when William would have none of it. Saoirse: Now, this is going back to, did Beauchamps represent Ethan with the purchase for Riddlesford? Saoirse: Why is the registration in his name in Irish? Joe:	Well now, sorry I'm not going to (Unintelligible) that information, sorry. Joe:	I mean, for example, whereas I've given you information you are not entitled to here, but I'm happy to give it. Joe: But I can't give you any information about your brother's affairs, without his permission, sorry. Saoirse: No, no, that's all right. Ok, what I'm going to do, let me see, there, we've got ah, so there's no records for the Revenue at the house? 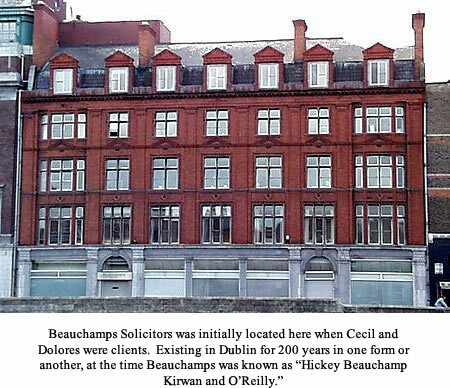 Saoirse of course first heard of Beauchamps when she received The Solicitor's Letter, in January 2010 to which she replied to Mr Bowe, describing her fears for her mother, and the isolation and abuse Dolores suffered from and asking for his help. She sent more letters into the following month, ending with informing him that she had been told by the HSE that Ethan was claiming Power of Attorney over Dolores. Mr Bowe declined to respond to this. Saoirse wrote him off as a source of help for Dolores. At the time, Saoirse had no idea that Mr Bowe was also acting for Ethan as his solicitor. Saoirse was yet another source telling Mr Bowe that his client Dolores was in danger from his client Ethan. Yet, in our narrative of Dolores' Last Year we will find Joseph Bowe taking later actions that had the effect of helping Ethan further isolate and control the life of his client Dolores Maxwell. Further to my email of 24 September last to which you have not given me the courtesy of a response. This is a family matter which I am sure you will understand. I attach an email I just received from HSE today regarding my mother. I am sure you will note the reference to Ethan and that there is some clear agenda going on with him. Fortunatately HSE are keeping an eye on my mother, your client, even though it is clear there is actually nothing they can do to protect her. I would appreciate if you could take some action in relation to your client before it is too late. I suggest you contact the Gardai for family background information as there is history of the gardai repeatedly being called out to monitor my mother's situation. You will also find that her doctor, Doctor Redacted, his practice was in cabinteely, had also been aware of family background issues. I would stress that it is vital that you do not pass this email on to your client as HSE are extremely nervous of anyting being done that could worsen my mothers situation and deprive her of their facilities which would put her at risk. The reference to Ethan in this mail should give you an indication of my mother's predicament. I am contactable on Redacted or you can get hold of Sean on Redacted or any of the other family members copied in on this email if it would help your position. Further to earlier emails please find attached a copy of an earlier response from HSE elder care abuse. You will see from the time and date that there is inconsistency between this and the date my mother was admitted to hospital which was mentioned in the mail I sent to you yesterday. I have been informed that the hospital have been told by Ethan Maxwell that he is her next of kin and that no one else is allowed to see my mother and that no one else is to be told that she is in the hospital. Furthermore I have also been informed that Ethan Maxwell has advised the hospital that he has power of attorney over my mother. I have to inform you that given the nature of events taking place and given the tone of the mail from HSE that we as a family are now being forced into a situation where we must take further action because of the poor situation my mother is evidently in. You are my mothers solicitor and have advised that she is of sound mind. We would as a family appreciate any assistance you can give us in this very delicate matter. You will note the HSE reference to not wanting to risk her attendance at day centre etc. This is a clear reference to my mother being under duress and given the statements below and what the hospital have advised us of Ethan Maxwell's actions all the evidence points to my mother being under duress from him. As you can see my mother is in a helpless situation and I fear that my correspondence to you recently has found its way into Ethan Maxwell's hands which could explain why the hospital say they really do not know what is wrong with her. My feeling is that she has given up hope following her years of duress from Ethan and cannot fight anymore. This is a hopeless situation that we as family can do nothing about. Let me be clear we as a family have absolutely no doubt that my mother is of sound mind. That was never an issue, our concern was alway that she was acting under duress. Historically there is evidence of this. You need to bear in mind that because of my mothers health even if she manages to recover and is sent home she will not be in a position to care for herself. That means she will be completely at the mercy of Ethan Maxwell. We will be alerting the HSE to this so that they can take some action if at all possible. We do hope as a family that as our mother is under hospital care that for the moment she is in safe hands but given the duress she has suffered it is unclear whether continued contact with Ethan Maxwell puts her health at further risk. Your assistance as my mother's solicitor would be appreciated but you need to bear in mind that time is of the essence in this matter. As pointed out in earlier emails it is critical that you do not release this message to Ethan Maxwell. I am sure you will appreciate that I have to do something to try and help my mother god rest her soul. I again plead to you as my mother's solicitor to protect her interests. The locks on mom's house have been changed and her phone disconnected. Who has this authority to do so and where is it in writing? I would like to see this. My mother is not dead and were she to recover how could she return to her home and maintain some sort of contact with her family with no phone and no way to enter her home. I understand she hired you to act on her behalf. The HSE Elder Abuse Department are investigating the circumstances into her mysterious admittance to Wexford General Hospital on Sept. 26 whilst under the care of her primary caregiver and Power of Attorney Ethan. No paperwork has been provided to this affect and I would question the authenticity of same if it were provided. I believe you'll find the signatures do not match any of my mom's you have on file. I also believe the same to be true regarding my late father. I plan to continue ensuring my mother's safety and interests as long as she is alive and that I began in December 2009 after witnessing distressing incidents in my mother's Rosslare home. You have this information on file. I will also pursue this upon her death so that no other family has to endure what I've encountered (and my siblings) since my return to Ireland in 2008. I have witnessed during my stays at mom's hospital bedside flashbacks that continue to terrorize my mother. She recoils from touch, loud voices and the rough pats on her head and jiggling of her right sore shoulder when Ethan and Ronan are visiting. My mother cannot speak for herself and needs someone to do so for her. Again, you indicate you are that person so I'm hopeful you will ensure her protection and peace in these remaining days/weeks or however long she's alive. Joe:	…with your mother's affairs. And we will be able to pursue all that, like I will be your mother's solicitor. Joe:	I mean, I know I did act for Ethan in the past, you know, you know that because I did act for him when he bought a house. Saoirse:	…very, very, just, physically, I was afraid, but you know, I took the risk. Um, so, somehow, this guy needs to be stopped, and I don't know how we can stop him, but what he is doing here are crimes all over the place. This, he's left Mom like this, money has, there's problems with money, there's, I mean you look at any of the accounts, Mom's accounts that were in her bag, it's very questionable why all this money has been spent in the month of August for instance. Mom is not a big spender; she's a very simple person. Saoirse:	There's hundreds hopping right, left and centre, there's, there's a bill for White's Hotel for like almost eighty euro on the Friday before she even came in here. Saoirse:	I, I would question every single bill. Saoirse:	Everything belonging to this. I have spoken with Ethan on a few occasions recently and he called to our offices today. I think he is very stressed at the moment and it might be better not to contact him unless absolutely necessary. I know there will be issues to address later. It just never occurred to anyone (to our knowledge) that it would be even a remote possibility that Mr Bowe would be representing Ethan. After all, Mr Bowe's client Dolores Maxwell was lying in Wexford Hospital while her medical team tried to understand her puzzling and desperate condition, which they were unable to do to this day. I have been checking what sort of executor costs would generally be charged around town for an estate of the size of my mothers. I am told by my legal advisor that an appropriate executor fee is in the region of 1% plus disbursements. In this case the fee should then equate to approx €3,000 if the estate value is only €300,000. Can you confirm that the executor fees in this case will be as I have outlined above. I naturally have a concern that anyone who is not a beneficairy of my mother's estate could find a way to extract money from the estate in breech of the terms of her will. Fees for acting as executor is one such area including claiming for costs. As you know we are aware as a family that inappropriate expense claims were made against my late uncle's estate (Patrick Maxwell) for such costs and purportedly sent by my late father and I am keen to ensure that this does not happen in this case. The executors of his estate are quite rightly concerned that what happened to their late uncle's estate does not happen in our case. I do have to express my concerns regarding the awful position my mother was in at the end and that I find it extremely irregular that Ethan has remained as executor of her estate. Finally I have noted that you are working on the basis that the level of inheritance by Ethan is so low that his pps number and CAT position can be ignored. I assume that you will be taking into account in that regard any previous gifts or inheritances he may have extracted from my late parents. I am sure that Ethan will be able to tell you what funds he received from my late mother and father and reconcile these with funds withdrawn from my mother's/father's bank accounts. Saoirse:	Well, and that's, 'cause you mentioned that the time we were all down there and that's more where I was coming from, was that things do have to be boxed up, and you know, my concern is I know full well Ethan is going to charge the estate for all that. Joe:	(Unintelligible) yeah, yes he is. Saoirse:	I think 'cause he saw how he could control all of this, and I mean basically, what he in reality wants to do is just drain the estate. Evidence of scams, grants, forgeries and attempted insurance frauds. Issues regarding Patrick Maxwell and his estate. Use of various aliases and addresses. Statement of Ethan's nephew, detailing physical abuse of the nephew and both Cecil and Dolores. Backlash that occurred when anyone tried to visit Dolores. Five pages of questionable financial transactions from Dolores' accounts. List of witnesses with knowledge of the abuse unleashed by Ethan towards his parents and others. As long as it was, there is much we left out of the background above. 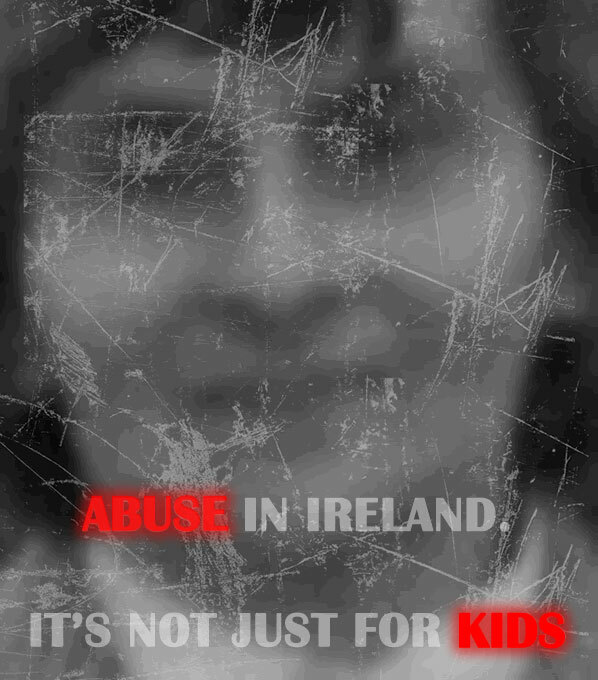 Readers who desire more are referred to Saoirse's Further Affidavit to the Solicitors Disciplinary Tribunal. …I discovered that your sister Mari had written to our Managing Partner. She referred to “fraudulent charges for a headstone in this estate and other irregularities, the presence of a non existent and unregistered company and the omission of gifts on the CA24 [Schedule of Assets] and which I reported to the Revenue”. She also included copies of e.mails you had sent me. I know nothing about the matters to which she refers and I have asked her to elaborate. Obviously, Mr Bowe's statement declaring his ignorance would be false if he knew something about even one of the items Saoirse mentioned in her letter to Managing Partner John White. So let's look at each one, and see if Mr Bowe might have known about them. RE: The estate of your client, the late Dolores Maxwell. I've recently discovered some things concerning Mom's estate that need to be addressed. Before Mom died, I spoke with you about my concern that if Ethan Maxwell was an Executor of Mom's estate, he would continue the plundering of Mom's assets that had been going on for a long time. You assured me in the most adamant terms that you and John would not let that happen. My brother Redacted also raised his concern about this very thing to you, noting the efforts by your co-Executor Ethan Maxwell against Uncle Paddy's estate. You have also been urged more than once and by more than one of Mom's beneficiaries to check every statement, check every document, verify everything because of your co-Executor Ethan Maxwell's history of lying, forgeries, use of aliases, etc. You were provided ample documentation supporting the need for this. It was good advice, given in good faith and with good reason. A letter was sent to you, not very long after your co-Executor Ethan Maxwell had taken possession of one of the two grave plots owned by Mom. It was dated 22 July 2010. In this letter the author states that a gravestone had been erected on Mom's plot in Deansgrange Cemetery, St Mary's 67 B2. This is the plot where Mom is buried. That a gravestone had been erected there seven months before Mom's death is undeniable. When first discovered, it came as a complete surprise, although of course not to your co-Executor Ethan Maxwell. Within the Inland Revenue Affidavit the Executors submitted to the Probate office in April 2011, as part of filing for a Grant of Probate, there is a charge against the Estate for a gravestone from Harrison Burnell, the monument company across the street from Deansgrange Cemetery. Harrison Burnell has never done any work on Mom's plot. None. They are not contracted to do any work. They have never been authorised to do any work. They have not agreed to do any work. They assure me they have never submitted an invoice or any charge whatsoever to Mom, her estate, or the Executors for anything. They are very nice and professional at Harrison Burnell. The person I am in contact with even walked over to Mom's grave for a firsthand look. Harrison Burnell confirmed again that the headstone and kerbing on Mom's grave was not erected or supplied by them, and that indeed they have never done any work on Mom's grave. Unprompted by me, Harrison Burnell brought up the name of your client and co-Executor, Ethan Maxwell. Of course this comes as no surprise to anyone. What I was informed about Ethan Maxwell from Harrison Burnell is disturbing. It also makes me think it very likely Ethan Maxwell has attempted to further defraud Mom's Estate with even more charges from “Harrison Burnell” since the filing of the Inland Revenue Affidavit. This is enough information for you to confirm this and act. The “Harrison Burnell” incident goes much further in both breadth and depth than the very basic description I have provided you here, and has opened up further lines of enquiry that have revealed yet more illegal activity committed by your co-Executor Ethan Maxwell. Your co-Executor Ethan Maxwell swore under oath that the affidavit to Revenue he signed was true. He obviously and provably perjured himself and not solely in relation to Harrison Burnell. (There are also glaring omissions in the Revenue Affidavit that the Executors are most certainly aware of.) A check with both the Probate Office and Revenue confirms that the Executors have not made any corrections to the original Inland Revenue Affidavit as of 06 January 2012. If these charges against Mom's estate were paid, as it seems they were (since payment has been disbursed to Mom's residual beneficiaries and unlike other entries these charges are not marked as "A/C Due") then I think it prudent to assume your co-Executor Ethan Maxwell defrauded Mom's estate. If these charges were not paid, I think it prudent to assume your co-Executor Ethan Maxwell attempted to defraud Mom's estate. It is consistent with his nature and his past behaviour, as you well know. Complete and utter transparency is needed from the Executors concerning this. The course of action to be taken by you and John seems clear: Recover any funds paid out from Mom's estate because of fraudulent or false claims (and at no expense to Mom's Estate given your knowledge of Ethan Maxwell's history, and the warnings you were given about this very thing), and refer the matter of your co-Executor Ethan Maxwell's fraud and/or attempted fraud of Mom's Estate to the Gardai. I fear you will not; indeed I believe you cannot. You recently stated to the Tribunal that you act for Ethan Maxwell. As you know, I sought clarity some months ago concerning Beauchamps' relationship with Ethan Maxwell, and am gratified you have now finally and openly confirmed that Ethan Maxwell has been and is now your client. The conflict of interest is explicit. You and John cannot act upon these fraudulent charges to Mom's Estate without exposing your client and co-Executor Ethan Maxwell to prosecution and/or other legal action. Yet failing to act is detrimental both to Mom's Estate and her nine residual beneficiaries. This is of course but one example of many where acting in your client Ethan Maxwell's interest is in direct conflict with the interests of and detrimental to Mom's estate and the residual beneficiaries. You have stated that if there is a conflict of interest, you would resign immediately. I hold you to that now. All three of the Executors need to resign. As you say, if your co-Executor Ethan Maxwell is convicted of murdering Mom, that won't disqualify him from being Executor; fraud is another thing, and will disqualify him. John's attempts to blame you and lay all the responsibility at your feet I think falls short of absolving him of responsibility. He was appointed solicitor/Executor in the will. He accepted that role. As you know I do not want to have Mom's estate hurt or decreased by as much as a farthing. That's why I made it clear to you that I was willing to completely assume the costs of the investigation into her financial and other records. That is also why I would prefer that I don't have to make application to the High Court to have the Executors removed. I am aware that you could then charge Mom's Estate for any applications, appearances, or defence, etc. you would make before the High Court. As you've stated, the more you charge Mom's estate, the happier your co-Executor and client Ethan Maxwell will be. I urge the Executors to make application themselves before the High Court to be removed, with absolutely no charge to Mom's Estate. I feel this is a reasonable request. The High Court can then appoint independent administrators to handle Mom's Estate. Independence is sorely needed. In your affidavit to the Tribunal, you state that “The Deceased's Estate is not significant.” It is significant to me, and I assure you it was significant to both Dad and Mom. (The fact that without your client and co-Executor Ethan Maxwell's involvement it would have been some €500,000 more “significant” merits a brief mention.) To see it become less “significant” under the Executors' administration is disheartening. Joe, Beauchamps has been involved with Mom and Dad for over twenty years, and my grandfather before that; Uncle Paddy relied on you also. Mom deserves so much better from you and your colleagues at Beauchamps. 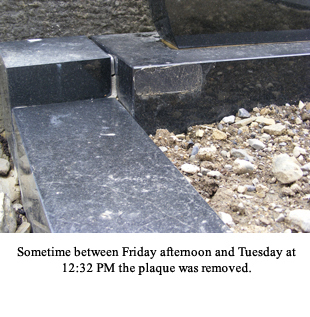 As you know, Mom was admitted to Wexford General Hospital on 26 September 2010, in very serious condition. She was taken to the CCU as staff sought to stabilise her and (unsuccessfully) explain the causes of her physical and mental state. I would like to know if your co-Executor and client Ethan Maxwell has explained why he called Mom's Home Care Attendant Redacted on that date hours after Mom's admission and lied to her, informing her that he was driving to Dublin with Mom sitting in the car beside him, that they would be staying in Dublin and that Redacted's home visits were not needed. (I'm glad he made that call; it directly led to Redacted and I being informed five days later by Elder Abuse that Mom was in the hospital.) If your client Ethan Maxwell has offered an explanation, please forward it to me. I suspect you may very well continue to disparage me and tell lies about me to the Tribunal and my brothers and sisters. That's fine. For my part I'll continue to gather, provide, and rely on evidence, documentation, facts and the truth. I will do so openly in full daylight with a clear conscience and my head up. As always, my sole motivation is justice for Mom, accountability of Ethan Maxwell for the horrible crimes he committed against Mom and others, and to protect others from Ethan Maxwell as far as I am able. On another note, do you really expect me to believe Mom instructed you to do a Google search for Nathaniel's address? Joe, please. If you are in possession of any further information or documentation in relation to your mother's assets or affairs, I would be grateful if you could forward same to me for onward transmission to the Solicitors who will now be dealing with the administration. The veracity of Joseph M Bowe's statement that he knows nothing about this seems to run into a problem with Saoirse's letter above. And we find that Mr Bowe was reminded of the headstone issue a few more times. I may stand corrected, but on a recent visit to the grave I am sure I saw on the bottom left hand side of the headstone a makers/manufacturer/supplier tag. Could this indicate where it was supplied from or could it be falsified. Having further looked at the received letter I wish to state for the record that most of the details in this letter I was not aware of and I am extremely concerned that I feel I am not being fully informed by the executors of all matters. I am particularily concerned about the attention to detail being given the all the claims submitted to the estate by Ethan Maxwell and I for one am asking the Executors for an immediate update on the estate. I decided to have a look for myself. In the attached images you will see where the supplier logo/name tag was stuck on but has now been removed! It had been stuck on with what seemed like general household mastic and not a professional cement that the supplier would use to highlight their work. Indeed the general cement work seems somewhat shoddy but I could stand corrected. I will not use terminology such as “if I am deemed reliable” as used by someone else – anyone can check this themselves. 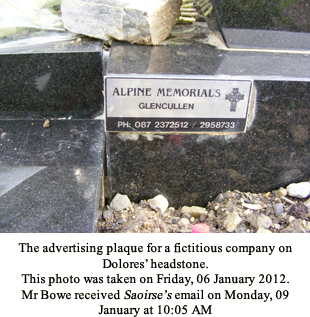 I did notice that on the website www.dolores-maxwell.com that there is a photograph of the headstone – if whoever took the photograph were to look closer in the original image it might indicate the details on the supplier logo/name tag. Does this match the submitted Harrison Burnell claim? I am sure now that this matter has been made aware among the benificiaries that Joe Bowe, W. John Cunningham and indeed Beauchamps as solicitors will have to act in this and other matters that are now coming to light. I expect that Beauchamps dealings with Ethan Maxwell as a client might be open to scrutiny and conflict. Furthermore, there is the matter of a purported charge/invoice/submitted claim submitted by Ethan Maxwell, executor, of €3300 from Harrison Burnell which needs to be verified with an original company invoice. I am asking whether any money has been paid OR IS PAYABLE to Harrison Burnell or Ethan Maxwell relating to grave or graves at Deansgrange Cemetery? This page could easily be five times the size it is if we go into detail here. We'll suffice with two examples. How about the fact that one of the witnesses to Dolores' current will, “signed” in Rosslare, said he never saw, let alone signed it? Redacted, Mom's neighbour and witness to her current Will, stated on April 11, 2011 he had neither signed it nor seen it. I have mentioned previously that Ethan Maxwell was using Mom's credit card while she lay dying in Wexford. I enclose one of Mom's credit card statements and a receipt to show this is true. Ethan Maxwell ordered a Redacted from the UK on September 27, 2010. Mom's account was charged €138.18. He had it shipped to himself at Redacted's address. You recall of course that Mom was in the CCU of Wexford General at that time, having been admitted the previous day. Mr Bowe may have a point here. We do not know if he was ever informed directly that “Alpine Memorials” is a fictitious and unregistered company. He would have discovered it with even the slightest bit of investigation into the issues about the headstone. 10. In Section 1 of Paragraph 3 of the Applicant's Affidavit, the Applicant also claims that I "represented both Dolores and Cecil Maxwell and Ethan Maxwell in a large purchase of property by Dolores and Cecil Maxwell for Ethan Maxwell while Dolores and Cecil Maxwell were under undue influence and duress from Ethan Maxwell in 2005." Such an averment is incorrect. Dolores and Cecil Maxwell did not purchase a property for Ethan Maxwell. I acted for Ethan Maxwell in the purchase of his own property. Dolores and Cecil Maxwell made a gift out of the sale proceeds of their property at Redacted to Ethan Maxwell towards the purchase of his property. I continue to act for Ethan Maxwell as I do for another sibling of the Applicant. No conflict of interest situation has ever arisen. Indeed. The value of this gift is estimated to be between €360,000 and €420,000. It is not mentioned on the CA24 provided to Revenue and the Probate Office. And even though the executors all swore under oath to provide a Corrected Affidavit if the information on the CA24 was incomplete or changed, the latest check with the Probate Office reveals no Corrected Affidavit has been filed. It mystifies us as to why Mr Bowe would issue such a flat denial of knowing about this stuff to the two very beneficiaries who would immediately recognise it as the blatant, bald–faced lie it is. We can only conjecture that the statement was designed for “internal” consumption in Beauchamps Solicitors. We note Mr Bowe's request to Saoirse to “…please supply details now.” Perhaps if Mr Bowe would be faithful to what he has received, more would be given. [Editor's note: Evidence has recently come to light that shows that as bad as the administration of Dolores' estate may seem, it gets worse. Much worse. We look at that along with a couple of other issues,and include Saoirse's further letters to the Managing Partner of Beauchamps Solicitors in An Open Letter To John White Part 3.